The silkie bantam is one of the more unusual breeds in the world of chickens. With feathers that look like fluffy down or silk, the gentle silkie looks more like a stuffed toy than a barnyard animal. Breeders of silkies often have difficulty determining whether the chick is a male or female. Even the experts are often fooled until that first egg is laid or that first crow is emitted. Silkies originated in China and were mentioned in writings from Marco Polo as far back as the 13th century. The unusual fluffy feathers, bluish-black skin and turquoise earlobes of the silkie are distinctive characteristics that other chickens don't have. Both sexes of the silkie are known for being docile and gentle — perhaps another reason that it is hard to tell them apart. The combs and wattles — lobes of skin that hang from a chicken's head — of a male silkie generally will be larger than the females at a fairly early age. The difference can show up as early as 8 to 12 weeks. However, not all males have a large comb or wattle and they may be mislabeled as a female until they begin to crow on a regular basis. Many silkie owners point to the distinctive crest of feathers on the top of the head. A female will have a rounded crest, almost in a globe shape. The silkie male will have streamers of longer feathers that stream backward from the lower part of the crest. These streamers are one of the first things an experienced silkie owner will look for to distinguish it from the female. Most experts believe that by the time the silkie is 8 or 9 months old, the characteristics that set the males and females apart should be distinguishable. 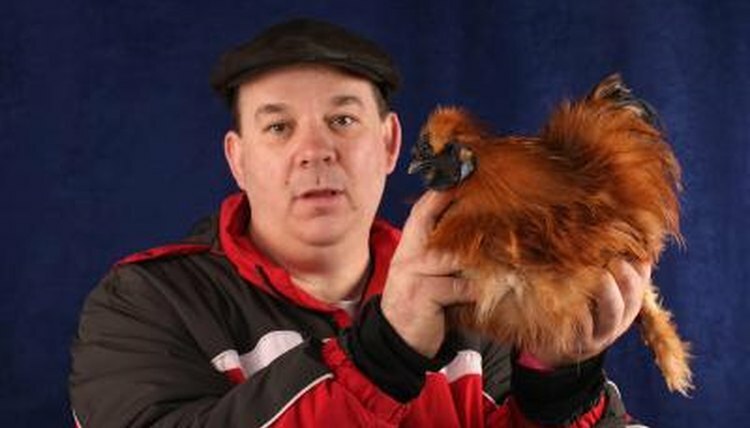 However, even then, it's not uncommon to see a judge at a poultry show standing outside the cage of a young silkie bantam and wonder whether the bird marked as a female is really a male -- or the other way around.